Photo Courtesy of Olivia Fleming. We love bringing you insightful and practical guidance for your wedding planning and so far have focussed on specific areas or steps in the whole process. This month we are taking a more holistic approach and looking at how to nail a particular type of wedding. Olivia Fleming the Senior Features Editor at Bazaar.com created the most atmospheric and flawless country wedding you could imagine and we really wanted the details on her planning process. As someone who had the pleasure of attending this wedding, I can assure you that you want to hear how she did it because it was truly spectacular. Enjoy the interview below and don't hesitate to post questions in the comment box. Olivia, how did you find your wedding venue? After a lot of online research! 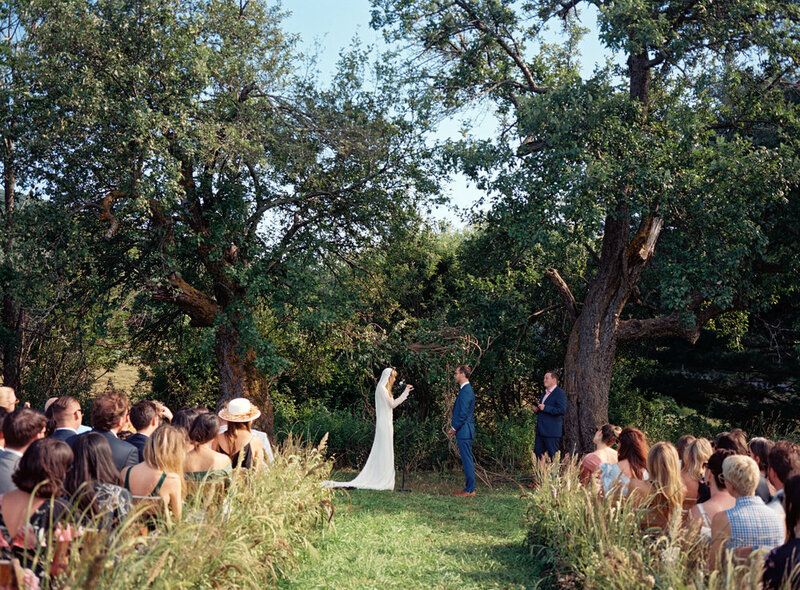 Our wedding was in the middle of summer, so I knew I wanted to have an outdoor dinner under the stars, surrounded by nature and summer’s balmy, fragrant evening air. I also knew that I have always had a thing against Terry tents (or marquees), and wanted to avoid having to use one as a rain contingency plan at all costs. 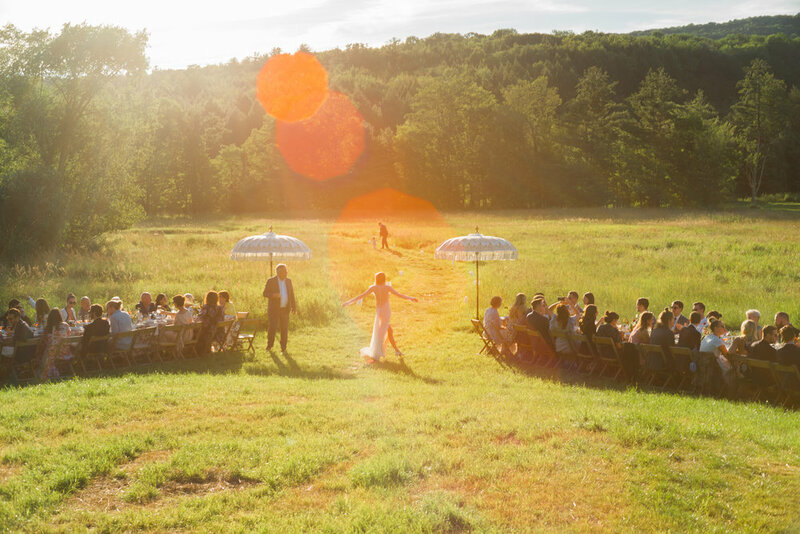 I had never envisioned myself having a “barn wedding” as “rustic” isn’t really my vibe, but when I first laid eyes on Hayfield, a new 80-acre venue in the Catskills flanked by mountains, it felt like I’d stepped into a fairytale. The large barn with huge sliding doors meant, worst case scenario, that dinner would be under a roof with views of the mountains. The logistics with a new venue must be complicated. Did you have to use a number of different suppliers? Hayfield provided hand-made farm tables and wooden chairs, which was one less thing to worry about! (Try finding nice chairs from rental companies—they are all very cookie-cutter, “wedding chairs” which, like the tent, I wanted to avoid for aesthetic reasons.) But otherwise yes, we had to bring in everything—which also meant that we were able to curate our dream day with no constraints on my “vision”. How did you find that process? Are there ways you could advise our readers to streamline their approach? Most brides are planning their wedding for the first time, so the entire process is usually overwhelming no matter what. I like to joke that you become an expert in something you’ll never do again. I relied on the phenomenal people around me and trusted their execution of their respective jobs. Our chef, Sohail, from Brushland Eating House took care of all the catering logistics. Our incredible DJ, Michael Saltsman, took care of everything related to audio. My advice would be to hire people you trust implicitly. Logistics wise does a rural location mean you have extra responsibilities to the guests? For example are you responsible for finding them accommodation or transport? 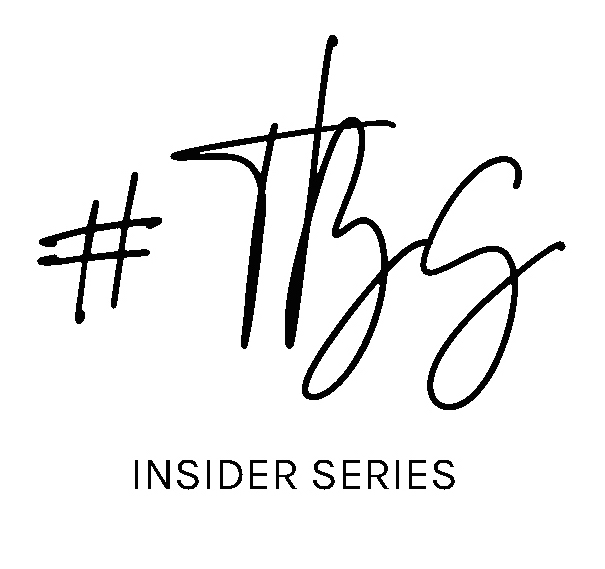 One of the reasons we chose Hayfield was because 10 minutes away was the very chic 60-room hotel, Scribner’s, which both Matt and I had already stayed at a lot. We had people flying in from all over the world, so I wanted to make sure (good) accommodation would be available to everyone rather than making guests parse through AirBnb looking for cabins in an area they’ve never been to before. (I also loved the idea of everyone we loved staying under one roof for the weekend, getting to know each other and bonding over their shared love of...us!) We arranged school buses to shuttle everyone from Scribner’s to the venue and back at the end of the evening. One of my favorite memories of the night was getting into the school bus and seeing our friend Kevin Morby, who played our first dance song, had created a make-shift band at the front of the bus to keep the party going. That ride back to the hotel is something I’ll never forget—so worth the added responsibility in the end! What are the benefits and also the disadvantages of a rural location for a wedding? There was no cell service, which could either be an advantage or a disadvantage depending on the person. For me, a rural wedding over the span of a weekend brings people together in a way that a one-night wedding in the city might not. My friends, many of whom met for the first time that weekend, now have blossoming friendships with each other separate from me—that’s the most magical thing you could wish for. How would you describe the aesthetic and atmosphere that you choose to create? I guess I would say I wanted it to feel casual, yet elevated. I wanted the aesthetic to represent that, so I opted for a summer garden party vibe that would feature my love of mixing prints and whimsical sensibilities, without feeling too “boho”. Where did you get some of your beautiful details like your parasols and table cloths? You served cocktails upon arrival in the field. This was such a nice touch! What were the cocktails that you created for the occasion? We wanted the cocktails to feel unique, light, and refreshing, so Sohail created a Rum Punch with orange blossom, rooibos tea, and pineapple; and a Tequila Paloma with lime, grapefruit, and thyme. If you did it all again would there be anything you would do differently? You also make the most incredible jewelry, how did you and your husband personalize the most important items of jewelry a person would ever buy? Matt made his own wedding band (he founded Mr O.K shortly before we got married) and we set my birthstone, peridot, on the inside. I also had it engraved for him as a surprise. I made my own, choosing a rose gold band (I love mixing metals) scattered with diamonds and one moonstone—Matt’s birthstone. if you enjoy reading about wedding planning click here to continue reading.